Through our educational programs, Hive is building a global alumni community of leaders and entrepreneurs who are creating a better world. 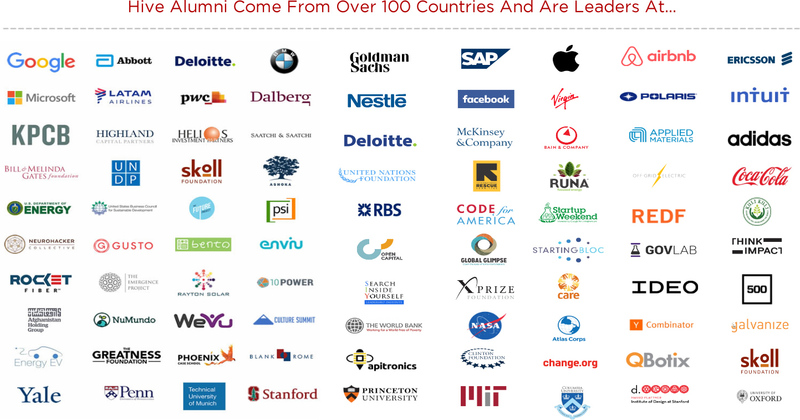 Hive Global first thirteen Global Leaders Programs (GLPs) have convened 1300 entrepreneurs, leaders, and innovators from 110 countries around the world. Join us. Register for the Hive Africa Global Leaders Program this October 25-28, 2017 hosted in Lagos-Nigeria. The Hive Global Leaders include CEOs of $200 million companies, award-winning social entrepreneurs, elected leaders, neuroscientists, Olympic Gold Medallists, Rwandan genocide-survivors turned inspiring public speakers, technology entrepreneurs, Columbia professors in International Affairs, Stanford design lecturers, Sudanese refugees turned innovators, renewable energy investors, Navy SEALs, engineers from Facebook, Google, and Apple, World Bank and UN researchers, venture capitalists, Virgin Galactic astronauts, and many more extraordinary leaders working to create a better world. We are bonded by our work in leadership and our desire to build a better future.